I’m not a terrible cook, but I am incredibly impatient when it comes to preparing my own food. After a long day of work, the idea of cutting vegetables, marinating meat, stirring a pot, and then waiting somewhere between 30 to 60 minutes to eat is excruciating. Still, microwaving ready-made meals is sad and a diet of constant takeout is something my increasingly slow metabolism can’t justify. 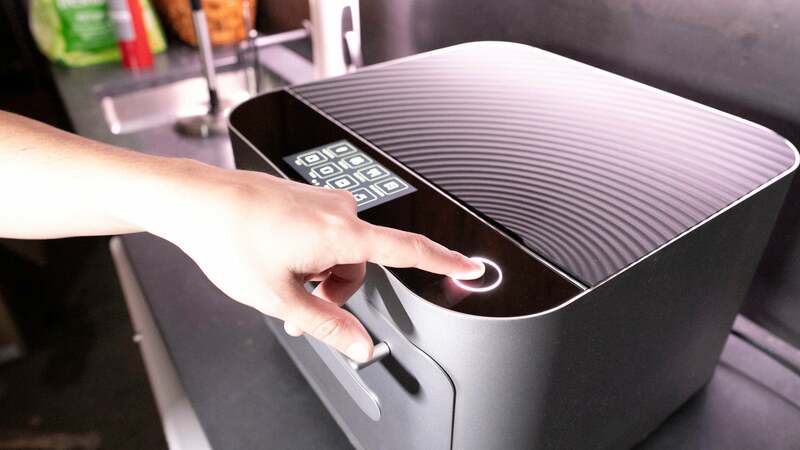 That’s why Brava’s claiming its fancy smart oven requires no preheating and can cook food twice as fast as regular ovens caught my eye—it claims it can heat to 500 degrees Fahrenheit (260 degrees Celsius) in just under a second! Plus, it’s supposedly got some brains to help automatically calculate the precise cook time for the ingredients, as well as a companion app for recipes, cook notifications, and a camera to watch your food cook in real time. But in the course of testing this super smart (and pricey) oven, I may have—inadvertently—torn my office apart. Like: Fast cook times. Compact. Can spy on food. Don't Like: Expensive. Sparked office civil war. It wasn’t because of the looks of the Brava. It is pretty snazzy and sleek—almost as if a MacBook were an oven. It’s made of brushed steel, and up top there’s a nice textured pattern in black. Plus, it’s quite small—which is either a good or bad thing depending on what you’re trying to do with it. 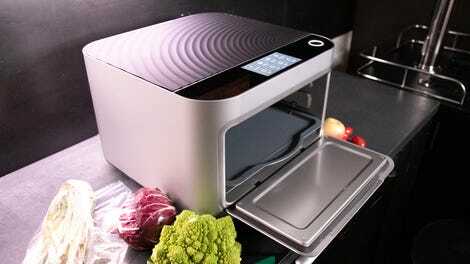 It measures 11.3 by 16.4 by 17.3 inches, which is comparable to your average microwave. The compact form factor does mean there isn't a whole lot of space to cook things. The cooking chamber measures 6.4 by 13 by 12.5 inches or 1,040 cubic inches. While you can, technically cook a whole chicken, you’d be courting a fire hazard to stuff a Christmas turkey in there. There are only two racks, and you’re only going to cook with one tray in there at a given moment. That’s fine if you’re trying to feed 1-2 people—three maybe if one of them has the appetite of a skeletal bird. But any more than that is a stretch, and I can’t really imagine trying to cook an entire holiday feast without some strategic prep work ahead of time. There are six lamps inside—three up top, three on the bottom that zaps your food with visible and non-visible light. On the smart touch display, you can select from a series of different ingredients, combo meals, or settings like sear or bake. So to test this out, I thought I’d make a simple, healthy meal of chicken legs and asparagus. Unfortunately, that wasn’t one of the preset combos that are optimised for the Brava, so I chose to prepare them separately. The asparagus was easy enough. I hit the relevant ingredient menu and read the instructions, nodding like a mad scientist along the way. All I had to do was find a knife, chop off the ends, add a little oil, a little salt, and hit the button. 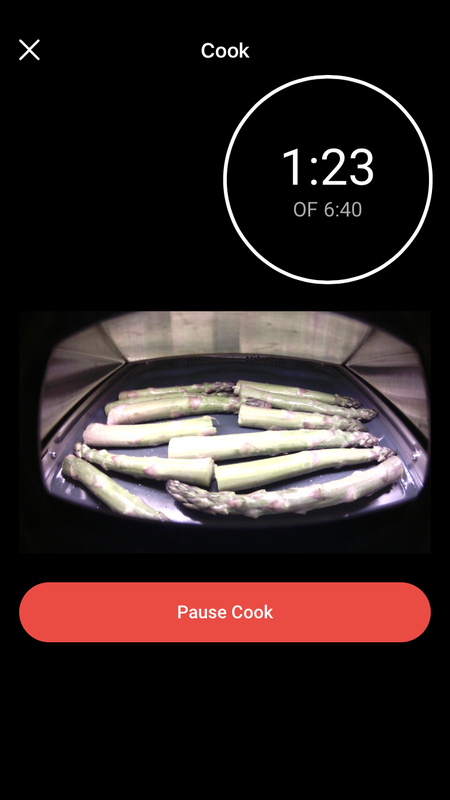 There’s a 5MP camera inside, so I could easily spy on my asparagus as it cooked from the touch screen or the app. After roughly seven minutes, the oven dinged to let me know they were done. Success! The asparagus was appropriately tender and pretty tasty. Now for the chicken...which is when things started to go sideways. First off, the oven told me I had to wait for it to cool back down to 120 degrees Fahrenheit (49 degrees Celsius). This didn’t take forever, but it was just long enough for me to get antsy—after all, I was eager to see if I could get this meal cooked in about a half-hour even if the ingredients were cooked separately. Finally, it was time to prep the chicken. My pack of drumsticks had five legs in them. The Brava trays are divided into three zones, and one zone can only fit four drumsticks. That meant I had one zone with a single leg, but I shrugged and hoped the Brava would be smart enough to accommodate. After all, I’d stuck the temperature sensor in the thickest drumstick so...theoretically everything should have been fine. Alas, my hubris led to Chickengate 2018. 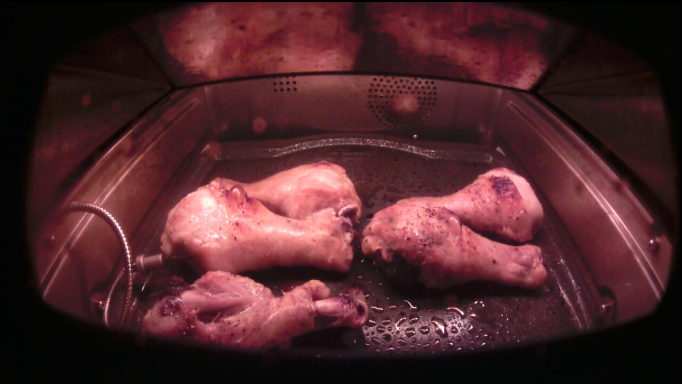 Despite the ability to neurotically monitor the drumsticks, I kept getting worrying notifications that the oven was increasing my cook times. First, it went from 17-28 minutes to 33 minutes to 38 minutes. There was a slightly singled smell coming from the oven and I decided to overrule the Brava and rescue the legs. The result was overly charred, somewhat dry, and according to my coworkers, bland chicken. This was an instance where I expected the smart oven’s brains to be better than mine. It was not. What ensued was a long office discourse on how it smelled like something died. I was then reminded of proper workplace kitchen etiquette. Coworkers did leap to my defence noting this was a serious experiment in the name of tech journalism, but even I had to admit it was impressive that the smell of slightly burnt chicken wafted through two floors of an office. Would Gordon Ramsay yell at me for cocking up such a simple dish? Probably. But burned chicken and excellent asparagus are only two things you can cook with an oven. Baking is just as important, so after Terrible-Smell-From-the-Kitchen-Gate, it was time for a different tact. My boss plopped four pounds of scoop-and-bake cookie dough on my desk. Scoop-and-bake cookies are basically idiotproof. You scoop cookie dough, you plop on the tray in roughly even balls, you bake. 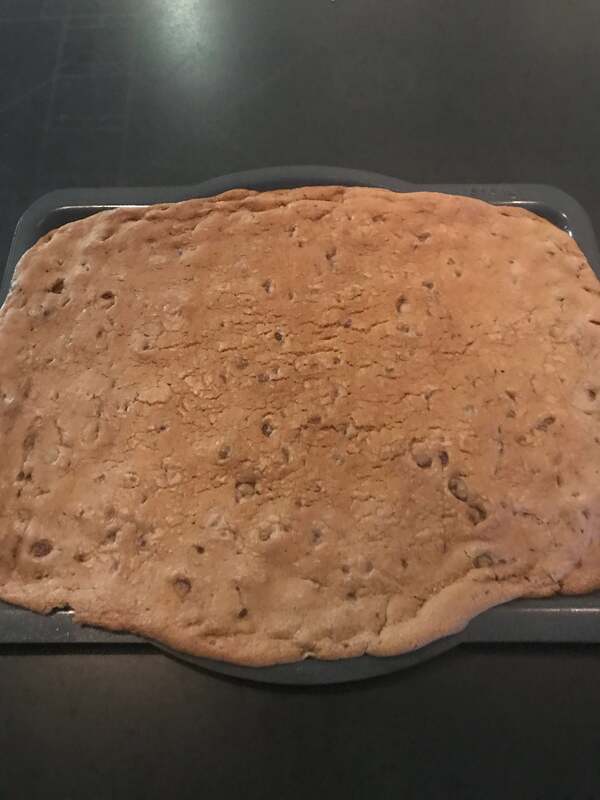 I made three batches of regular cookies, and one monstrous cookie cake and overall, the results for these idiotproof cookies was somewhat inconsistent. I was also surprised that when it came to baking, the Brava needs to be preheated like any other oven, especially since the whole benefit of a smart oven is eliminating that need. Brava told me this was because “certain reactions from preheating ovens is integral to the chemical reactions that occur when baking.” Hence, why I had to manually preheat the oven and set my own baking times for each batch of cookies. Still, preheating the Brava to 350 degrees Fahrenheit (177 degrees Celsius) took about 3-4 minutes—infinitely faster than a traditional oven, especially when you have a line of ravenous coworkers ready to chomp your head off for not baking cookies fast enough. The fourth batch, the cookie cake, was perfect and unanimously voted best despite its monstrous appearance. But I would still say the Brava was not ideal for baking. Not because of any technological incompetence, but because of incredibly small batches. I was only able to bake 8 cookies at a time, which then sparked Cookiegate. 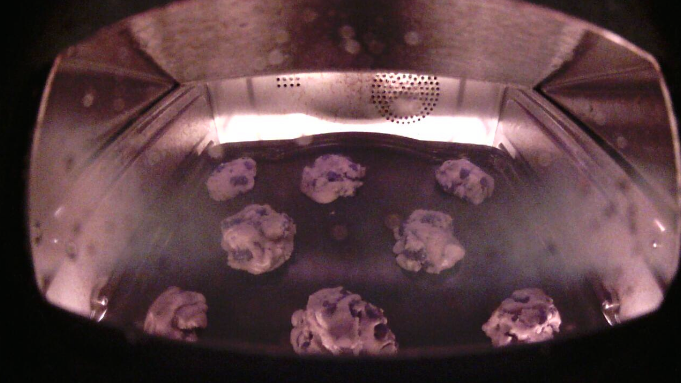 Chickengate haters were now on board with the smell of warm cookies and I could not bake fast enough to meet demand. And while it is significantly faster at heating most food, it is only marginally faster at cooling down. I also expected a little more brains from a smart oven. Especially for $995! Unfortunately, there was still quite a bit required from my dumb human brain. Yet the real challenge for the Brava Oven and its six fancy lamps was to save me time. And on that front, it kind of failed! Brava currently has a series of preset combos specifically designed to cook food efficiently as efficiently as possible, and when you go off book, as I did with the chicken and asparagus, Chickengate 2018 happens. Brava told me you can substitute ingredients—apparently, baby broccoli and asparagus are interchangeable. But to figure that out, I’d have to go through their Brava Chef Concierge support and Facebook community. I just want to throw on whatever I have in my fridge, man. Plus, those limitations really restrict how much creativity you can put into your food, and isn’t that really the joy of learning how to cook in the first place? As far as I could see, there wasn’t much support for making up your own combos. And that means cooking individual ingredients separately, which overall takes about the same amount of time when you factor in oven cool down as...using a regular oven. And a regular oven either comes with your home or apartment and the benefit of larger internal capacity. The same holds true for baking. If I wanted to make a 9-inch double layer Genoise sponge cake, that’s just not going to happen in the Brava. And 8 cookies is just an insufficient batch. To make, say 24 cookies it would take about 36 minutes. With preheat time, that’s again, about the same overall—if not a smidge longer—as a traditional oven. 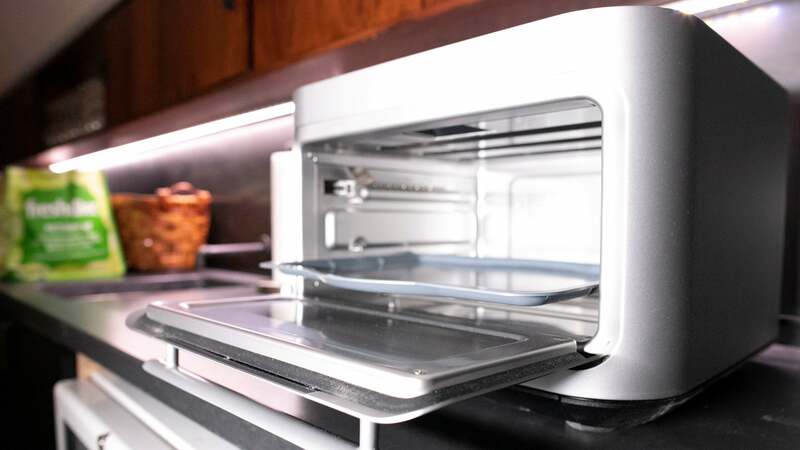 I’m not saving more time than heating up a frozen dinner in the microwave—which costs just a fraction of the Brava’s $995 price tag. Ultimately I’m still not sure who this is for—other than rich people who live in a tiny apartment with no oven or stove. But even Sharp’s Superheated Steam Countertop Oven also eliminates the need for preheating for a much more reasonable price at $500 (£395), and the second generation of the June, which we quite liked apart from its exorbitant price tag, is now just $600 (£474). The Brava simply doesn’t make sense or perform well enough for its cost. So skip it, but one of the cheaper options recommended above or just learn to cook on your damn stove or order delivery. Spying on your food is extremely fun. Heating times are fast but the small cooking area sort of negates time savings overall. Limited preset combos also limit cooking creativity. Best suited for rich people in small apartments. Does this Venn diagram even exist? Made very delicious asparagus and cookies though. The chicken was meh. Could have done without office civil war.